January | 2013 | Not Your Average Hockey Blog. Dear readers and hockey fans! It was high time I decided to start writing about hockey and I am happy to be part of the team of writers for your Not Your Average Hockey Blog. This is my first post as introduction for now while I am working on an article about the Flyers and my thoughts on their poor start. I intend to write about subjects such as top junior prospects, draft rankings, NHL Drafts, situation with NHL teams, particular stats or just another one of those issues happening in the NHL. I comment about facts not on ”what if”s. I also don’t denigrate any player or team. I was born In Quebec and still live here. I am following mainly the NHL, Canadian junior hockey and prospects playing oversea. My passion is to watch a kid make it through the junior ranks, being drafted and watch his first couple of years in the NHL to see how he develops. I am a Flyers fan for as long as I remember but I follow all the other 29 teams. I see, read and hear everything that concerns the Montreal Canadiens because I live in Habsland so expect an article or two from moi on the bleu blanc rouge. Enough for now. Enjoy the game and I will be back soon. Hopefully by then the title of my article about the Flyers could be more positive. You can follow me on Twitter @gillistheone for comments on hockey and life in general. I follow back. Wow, nobody was expecting the Montreal Canadiens to start the season 4-1-0…at least i wasn’t anyway. This shortened season could prove to be rather a strange one but i sometimes need to remind myself were only 5 games into this 48 game season. Its been quite the wild couple of weeks here in habs land with the Gomez buyout, the P.K Subban contract dispute and Max Pacioretty gone for about a month, alot of distractions to begin a short season! A few surprises and young stars in the making have made these first few games exciting to be a habs fan. First of all lets give Andre Markov a round of applause! WOW! Did anyone predict he would be playing as well as he has been lately? 4 goals and 3 assists in 5 games tied for the team lead in points along side red hot Rapheal Diaz and his 7 assists. He is one of the main reasons Montreal is winning hockey games and helping to resurrect there power play, which was horrible;e last season a big reason the habs were dead last in the eastern conference. Markov isn’t the only hab turning heads so far in this young season, a pair of rookies are also giving us a reason to be excited for the future. Alex Galchenyuk and Brendan Gallagher have been impressive as well. Galchenyuk has 1 goal and 4 assists in his first 5 NHL games and Gallagher has 2 goals and 2 assists in his first 4 NHL games. These two rookies have been playing great along side Brandon Prust. Personally i think they have been one of Montreal’s top two lines so far this season. My 3 stars for the first five games so far this season would be Andre Markov, Alex Galchenyuk and Brendan Gallagher. Ill be back next week to review the habs season after a few more games. Hey everyone, my name is Noam and I am the newest member of the Not Your Average Hockey Blog writers team. I am a massive hockey fan, and have been a loyal Maple Leafs fan for all my life. Hockey is my life, and I am very exited to be able to write about it. What you can expect from me – analysis of transactions, and a lot of predictions. I love to see which side got the better of a trade, who gained and who lost on a signing/departure, and the impact of draft choices. If you want to keep up with everything from hockey to the Leafs, and everything in between follow me on twitter (@noam_roz29). Today’s interview consists of Brendon Nash of the Florida Panthers organization and I. Brendon is a 6’3 defenseman out of Kamloops, British Columbia, Canada. He went undrafted in 2007, and opted to play his full four years for Cornell University in the ECAC. He played two games for the Montreal Candiens in the 2010-2011 season. 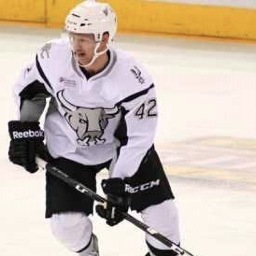 He currently plays for the San Antonio Rampage of the AHL. It was fun to interview him. He’s fun and goofy, but still polite at once. Great guy to interview overall. You can follow him on twitter: @bnash42. You can follow me on Twitter: @SkipThisChapter and @HkyBlogger. “Like” us on Facebook here: http://www.facebook.com/NotYourAverageHockeyBlog . We know this stuff is boring, so on to the good stuff! The actual interview! Enjoy! As usual, we are in bold. So first off, how has your day been? Well today was a pretty good day.. I can’t complain with the sunshine we get down here in Texas! What’s a day in the life of Brendon Nash? The life of Brendon…It isn’t the most entertaining but lately I have been spending a few days with Jacob Markstrom and that is entertainment in itself. The day starts with me putting my jeans on one leg at a time followed by a good breakfast of oatmeal, yogurt and berries, and a nice glass of OJ. Then I am off to the rink for practice/workout, whatevers on the agenda for the day. After that I like to get a good lunch in sometimes at home but usually at a classy joint like Panera Bread or Chipotle. During the afternoon I like to take care of errands if there are any or totally relax on the couch and surf the net…Weather permitting I will be poolside! Dinner is something I take pride in and love to cook a good meal at home. Mix it up between steak, salmon and chicken and let the body tell me what else it wants. So there might be a few readers who might not know who you are so maybe a bit about yourself? Cool fact or something? This is always the toughest… but I am a defenceman in the Florida Panthers system playing in San Antonio Texas for the Rampage. I hail from Kamloops, BC and attending Cornell University. Cool fact about me is that even though I am not the best golfer I got a hole-in-one at the tender age of 8. How old were you when you first laced them up? I have been on skates since I was 3 years old. I have been playing hockey since I was 5 when you were allowed to join minor hockey in Kamloops. Is there anyone you try to model your game around? If so, why? I enjoy watching Wade Redden play. He is calm, smooth and skilled. It was tough to see him in the minors after all the success he had in Ottawa but glad he’s getting another crack at it in St. Louis. During the off season, how do you spend your time? During the off season I am usually in Kamloops. I enjoy a nice round of golf and love to be on the water either hanging out on a boat or trying to wakesurf. What do you miss most about home during the season? My family. I have a great family and they are very supportive but at times its long between visits so it can get tough. Last year you were in the Habs organization this year you’re in the Panthers. Is there much difference? There is definitely a difference because Montreal is a hockey hot bed. Don’t get me wrong everywhere loves their hockey teams but in Montreal it is to the highest degree. I am enjoying my time in the Panthers organization and have the utmost respect for the people working here. In your entire hockey career what has been your highest point? The highest point has been playing my first NHL game. Its a shame it was an OT shootout loss to Buffalo but an unbelievable experience in Montreal. How about your lowest point? Losing twice in the NCAA tournament to go to the frozen four. How did you persevere from that? I took it as a learning experience and now know how to deal with the stress of important games. I don’t want this interview to be just another random interview you do, so the next couple question are a bit more random, but hey, it makes it a bit more personal and fun. What can’t you leave your house without? I am starting to believe I can’t leave my house without sunglasses…This Texas “winter” has been enjoyable and in the turn of a hat the sun always finds a way to poke through the clouds. Flying a helicopter. Its gonna take a little bit of training to do this but it will always be at the top…I’ve been able to check off airplane but I want to test out a helicopter. If you weren’t playing hockey, what would you be doing right now? I would probably be doing something boring like an office job…maybe travelling the world but that would be temporary with the dreams of saving up for helicopter school! Country…and sprinkled with a little top 40. Steak and sweet potatoes…I can eat that for days. Any advice for aspiring hockey players? Whether you think you can or you can’t, you’re right…Don’t let anyone tell you what you can and can’t do. It is all up to you. My path wasn’t the typical one to the NHL but they can’t take away from me that I have played a few games in that league. Many people told me I didn’t quite have what it took and got cut and undrafted but I made my dreams come true. Anyone you suggest I interview? I think a great interview would be Kyle Hagel off the Hamilton Bulldogs…He does a lot for the game of hockey and was a tremendous teammate and now friend. Sadly, we have been informed by our writer Mohamed Mohamed that he has decided to leave Not Your Average Hockey Blog. We would like to thank him for his dedication and his service to the blog. We wish him well on his future endeavours. In professional sports there is a need to chase perfection. Baseball has the perfect game, football has the perfect 2-minute drill, and evidently, in hockey, the Nashville Predators are chasing the perfect shot. In last night’s 4-3 shootout loss to the St. Louis Blues, the Predators were outshot 39-24 and took no shots in overtime. I don’t care how little you know about hockey, everyone knows that is not a recipe to win games. The Predators lack of shots on goal was not due to lack of opportunities. They did a much better job last night getting into the offensive zone than Saturday night against Columbus. It seemed once they got in to position to shoot, they passed instead. The worst example of the “pass first, shoot second” mentality came in the 3rd period during a Predators power play. The Preds had every opportunity to shoot and put the game away, but instead they skated around and passed the puck. Now, I will agree that the Predators passing and puck handling does need practice, but during a power play is not the time to do so. Sitting in the arena I actually thought the fans were going to jump the glass and go shoot the puck themselves. I’m not sure if this is Coach Barry Trotz’s game plan or if it is due to the fact that the “shooters” don’t have the confidence to pull the trigger. Either way this is an issue that needs a remedy…and quickly! What in the world is wrong with Craig Smith?? Reports out of the shortened training camp was that Smith looked bigger, stronger, and on the brink of a great season. If that’s the case, where is that guy? Last I checked NHL forwards are expected to take shots. Then tell me why Smith literally whiffed on two shots last night? And why, after that happened, do you put that same guy in the shoot out? Where was the defense last night? (and don’t give me the whole “we don’t have Ryan Suter” story). Roman Josi is doing just fine filling the gap that was created when he left. It seems that more often than not, the defense was out of position last night. Shea Weber doesn’t seem to have his top game back and there is only so much a guy like Ryan Ellis can do. I’m not sure if its lack of communication on the ice or just the fact all 3 defensive parings are relatively new, but something is not working. Pekka Rinne is an excellent goal tender, but when your defense leaves you high and dry you can’t expect him to be Superman. The Predators need to realize that it’s not Rinne’s job to bail them out of games and he’s just as human and prone to mistakes as everyone else. To say for the Predators to go into Minnesota tonight and pick up their first win of the season is a tall order, would be an understatement. This will be the third game for the Preds in four days where two of those games went into overtime/shootout. You know these guys have to be feeling the effects. It would also be irresponsible to say that the Suter storyline is not going to play any factor in tonight’s game. If the Predators can go in as a cohesive group willing to shot the puck, I think they can pull off the win. If not…it’s going to be a long seven game road trip. We’re proud to present our interview with Evan Cowley! Goalie for the Wichita Falls Wildcats in the NAHL. He’s draft eligible for this year, and is projected to go in the middle rounds. This is the first time i’ve ever interviewed a goalie because there’s a saying in hockey. Goalies are either wild (Bryzgalov and his fear of bears), or super boring. I was hoping Evan wasn’t a super boring guy who would make this unbearable. Luckily, he’s a fun guy to talk to. So make sure to follow him on Twitter @Ectendy1. Follow me on Twitter: @alsonlee91 @hkyblogger and like us on Facebook here: http://www.facebook.com/NotYourAverageHockeyBlog . Without further to do, here is our interview with Evan Cowley. So many of our readers might not know who you are. So tell us about yourself. Maybe something cool about yourself? I am 17 years old, 6’4” and have bright red hair. I was born in Cranbrook, B.C., but moved to Colorado when I was five years old. That’s where I have spent my life up to this point. A cool thing about me is that I love music, and I have played the drums for 5 years. I find it has helped my coordination a lot over the years and playing them is a part of my pre-game routine. A little bit about your past before high school. Did you play any other sports besides hockey? Yes, I was a very athletic kid. I won state championships in youth baseball as a catcher and soccer as a forward, and I played tennis, too. However, hockey was always my thing, I’ve loved it more than anything for pretty much my whole life. How old were you when your first put on the goalie pads? I got my first set of pads for street/pond hockey when I was five years old, and started club when I was eight. Did you ever consider playing another position besides goaltending? Ah no not really! From the moment I found hockey (when I was one or two), I have always wanted to be in net. I was the kid who sat in front of the coffee table with pillows on each leg, begging his dad to shoot on him as Hockey Night in Canada was on in the background. I loved studying the pros and reenacting their saves. I tried to emulate them. I would fit under the category of a Butterfly goalie I think. I seal the ice well, while using my size to fill the top of the net. I use blocking and reacting techniques, which is kind of unique. Most butterfly goalies prefer one or the other. But in the end I just try to do whatever it takes to stop the puck! Is there anyone you try to mimic when you play goalie? Dan Cloutier, and Luongo were two of my favourite goalies growing up cause the Canucks were/are my favourite team. Now-a-days I love watching Price, Rinne, Schnieder, and Smith cause I play similar styles to them. I’m “self-taught” so everything I have learned has come from watching the big guys. What’s a day in the life of Evan Cowley? Wake up round 8 am, eat a quick breakfast then head to the rink. Skate for about an hour and a half to two hours with the team. Some times I’ll stay on extra time to work with the teams goalie coach, Billy Pye. When I get home I will do school work, watch hockey highlights, drum, eat, or just hangout until around 2 when I go to the gym for a few hours. I also do Pilates twice a week. During the season, what do you miss most about home? I would say I miss my friends, family, and pets the most. I live in a great place back home and its tough being away from the great people there. Drum, read, play some video games with the boys, watch movies, and stretch. Most of our readers will never be drafted. So take us back to being drafted in the 3rd round by the Wildcats. What was that like? Can you maybe relive that day for us? Well the Wildcats had been talking to me for a few weeks before and leading up to draft day it looked like they were going to draft me. That day I was following it on twitter and I didn’t expect to see my name that early on. Paul called me soon after and gave me the lowdown on the camp, the team, and the city of Wichita Falls. It was super exciting just to be able to participate in the draft but to be taken that high, as a goalie, was unbelievable. Afterward we had a big family dinner to celebrate the good news. It was a great day! 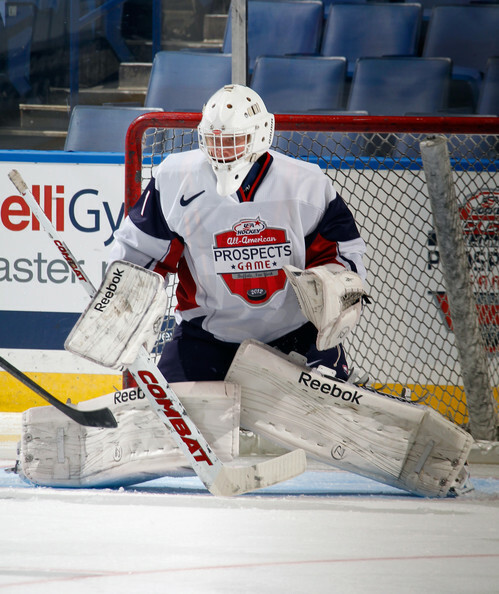 Being the only NAHL player participating in the inaugural All-American Prospects Game, what was that like? Participating in the AAPG was without a doubt the greatest hockey experience of my life. Just to be in the same room as Scotty Bowman, Rob McClannahan, Phil Housley, and all of the hockey royalty that was present was unreal. Then you get into the locker room with the best seventeen and eighteen year old hockey players that the US has to offer, while representing your league. Words literally cannot describe the feeling. Was it intimidating to be around the other players during the game, with players such as possible 1st Overall pick Seth Jones skating around you? It wasn’t super intimidating because I felt like I deserved and belonged in the room with them, but I did feel the pressure of performance. It really made me want to put my best foot forward to show the scouts, coaches, my family, friends, and really myself that I could play and do well against these top notch players. This year is your draft year. Let’s say I’m the GM of a hockey team, and I ask you, “Why should I draft you and not some other goalie?” What would you say? I’m big, athletic, passionate, driven, and will do whatever it takes to make a difference in your organization. I will set a positive example with my strong work ethic because I strive to be better every single day. Plus if you don’t draft me you, will have to problem of trying to score on me for the next 15-20 years, which will be no simple task. This is my first time interviewing a goalie so I’ve never had a chance to ask anyone this. What’s it like stopping a puck with your mask? It’s not fun. Your head rings for a while afterward and depending on where it hits you, it can hurt a bit. However, my mask is one of my favourite pieces of equipment, because without it, I don’t think I would be ballsy enough to be a goalie. In your entire hockey career, what has been the highest point so far? It was the game in Keni River, Alaska this season. I had the flu, my back-up was suspended, and my team didn’t play very well in front of me. I let in 9 goals and was rock bottom this season. I learned from that feeling and never want to feel like that again. The only thing you can do is learn from it. Like I said before, it’s a feeling you never want to experience again and from then on I was determined to be better. Every hockey team does pranks. There’s no secret. I doubt that your team is different. What’s the best prank the guys have done this year? The funniest thing I’ve seen this year was a couple of guys got a ton of saran wrap and covered a players car after a morning practice. It took him 20 minutes to get it all off! Do you have any advice for any aspiring goalies? As a goalie, the only thing you can control is how hard you work. I grew up as a AA player, up until last year, because I had no interest in playing AAA. Which meant I was on my own for instruction and was essentially a target in practice. But I was always the hardest worker and made sure I got better everyday and its because of that that I am where I am today. Do you have any recommendations of people who I should interview? Stolarz. He went through a similar situation as I am last year, and just switched from the NCAA to the OHL. He’s a great guy too. I like to end off my interviews with a random question that has nothing to do with hockey. You can have one super power. What is it and why? Being able to fly. Who wouldn’t want to fly!? Thank you for your time. It’s much appreciated. Good luck this season. I look forward to seeing you get drafted, and one day seeing you being an All-Star at the NHL level. This isn’t some generic ending, but I truly do believe you have what it takes to make it into the show.